Enjoy unlimited 100ºF hot water in just seconds with Zodi's High Performance self contained Hot Tap HP. 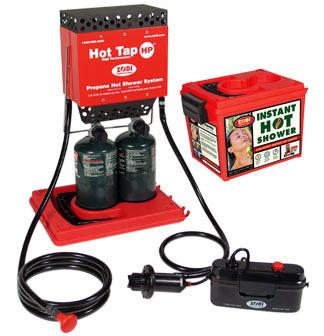 A complete system with push button ignition and battery operated pump that delivers great water pressure. Rugged storage case doubles as a 4 gallon water container. Extra performance for year around use. A great choice for 4-season campers, hunters and RV owners. Weight 14 lbs, Box size 15" x 11" x 11"